Fixed: [pmp_ipod] Compilation flag when Album Artist is "Various Artists"
Misc: Note that changes made to the ml database are not backwards compatible! Fixed: [ml_local] no longer causes unicode files in playlist to display ????? New: [ml_transcode] Transcoding tool. Convert your files from one format to another. New: [ml_pmp] Transcoding. Converts incompatible files on-the-fly for your portable device. New: [pmp_usb] USB drive support. 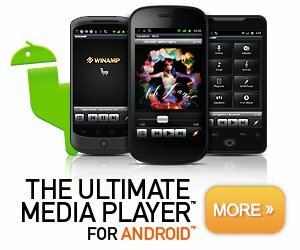 Now all those thumbdrive MP3 players can work with Winamp. Improved: [enc_aacplus] Improved AAC and aacPlus encoding! Fixed: main window not hilited when restoring from minimized state in classic skin. Fixed: Rating in pledit right-click context menu always shows "No Rating"
Fixed: [in_mp3] Critical security flaw fixed. Fixed: internet connection detection not working when set to "dial-up"
Awesome at low bitrates too! New: Grand Prize Winner of the Internet Surround Music Project! New: AOL Radio featuring (((XM))) Free Sampler! New: CD Ripping now available at 8x in free version! New: Over 200 new Milkdrop presets! Fixed: Winamp now supports adding URLs longer than 260 characters. Fixed: Editing files created in iTunes no longer causes corruption. Fixed: Sort selections in media library are now remembered. Fixed: Saved mute settings with modern skin. Fixed: Freeze when switching audio tracks in a multi-audio stream. Fixed: Fullscreen switching with scaled video window. Update: Dynamic Online Media can now alert users to live events(can disable). added send to -> add to library for playlist (and other) send to menus. fixed playlist editor classic redraw bug, made playlist handle mousewheel scrolling while moving items better. added timeroffstyle 3 and 4 to text object to display "0:00:00" and " : : "
made installer better handle installing wa5 directly over wa3.